Claber Ace Timer Duplo Battery Timer 8488 runs two different zones so you can have 2 garden hoses or drip systems. Dual Select offers maximum versatility combined with the simplicity of straightforward programming. Each line is independent and can be set to irrigate simultaneously or sequentially. Programs can be set with immediate or delayed activation. Backlit LCD screen allow easy reading of settings even at night. Requires 2 AA alkaline batteries (not included); settings are retained for 2 minutes when batteries are replaced. A 5 minute preset manual override allows to water between cycles or to stop programs without altering them. Built-in stainless steel filter, traps harmful contaminants. The 3/4″ tap connector comes with a pivoting ring nut for easy access to the unit when on the faucet. Reinforced ABS plastic construction for maximum longevity, fully insulated electronic circuitry and UV-stabilized polycarbonate cover for maximum protection against weather elements. Reliable solenoid valve designed for smooth water shut off that prevents water hammer impact on piping. 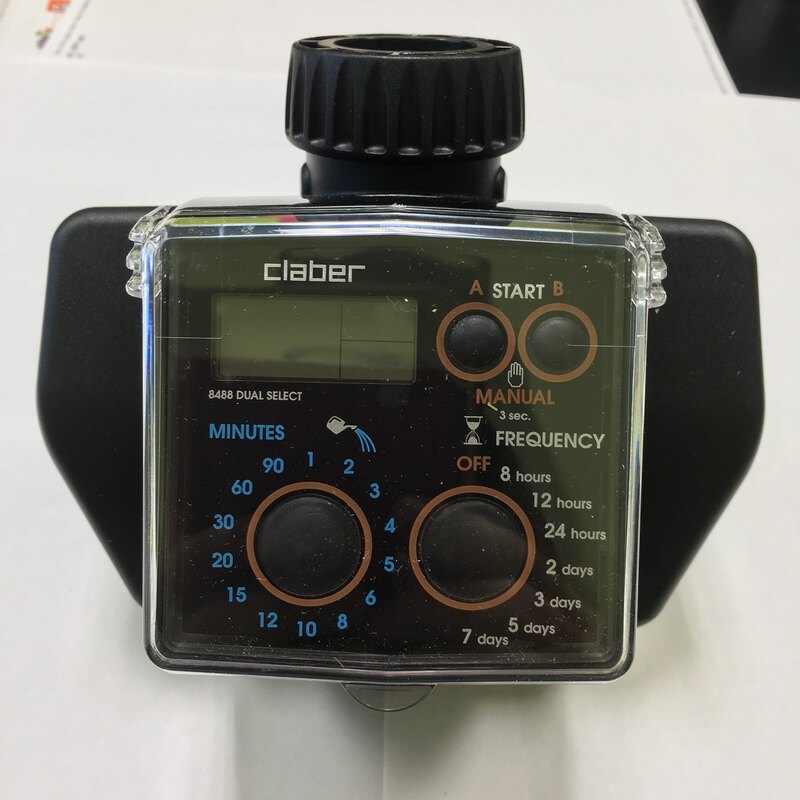 Timer has built-in connection for Claber Rain Sensor (sold separately). Unit is 100% quality controlled during manufacturing. 14 watering durations (1, 2, 3, 4, 5, 6, 8, 10, 12, 15, 20, 30, 60 or 90 minutes). Maximum water temperature of 104°F and outdoor temperature of 122°F.